Anatomical terminology is used by anatomists and zoologists, in scientific journals, textbooks, and by doctors and other health professionals. 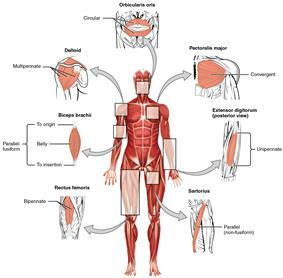 Anatomical terminology contains a variety of unique and possibly confusing terms to describe the anatomical location and action of different structures. By using this terminology, anatomists hope to be more precise and reduce errors and ambiguity. For example, is a scar "above the wrist" located on the forearm two or three inches away from the hand? Or is it at the base of the hand? Is it on the palm-side or back-side? By using precise anatomical terminology, ambiguity is eliminated. Anatomical terms derive from Ancient Greek and Latin words, and because these languages are no longer used in everyday conversation, the meaning of their words does not change. The current international standard is the Terminologia Anatomica. Anatomical terms are made up of tissue, or condition, whereas the prefix or suffix often describes the root. For example, in the disorder hypertension, the prefix "hyper-" means "high" or "over," and the root word "tension" refers to pressure, so the word "hypertension" refers to abnormally high blood pressure. The roots, prefixes and suffixes are often derived from Greek or Latin, and often quite dissimilar from their English-language variants. Latin names of structures such as musculus biceps brachii can be split up and refer to, musculus for muscle, biceps for "two-headed", brachii as in the brachial region of the arm. The first word tells us what we are speaking about, the second describes it, and the third points to location. When describing the position of anatomical structures, structures may be described according to the anatomical landmark they are near. These landmarks may include structures, such as the umbilicus or sternum, or anatomical lines, such as the midclavicular line from the centre of the clavicle. The cephalon or cephalic region refers to the head. This area is further differentiated into the cranium (skull), facies (face), frons (forehead), oculus (eye area), auris (ear), bucca (cheek), nausus (nose), oris (mouth), and mentis (chin). The neck area is called the cervicis or cervical region. Examples of structures named according to this include the frontalis muscle, submental lymph nodes, buccal membrane and orbicularis oculi muscle. Radial referring to the radius bone, seen laterally in the anatomical position. Ulnar referring to the ulna bone, medially positioned when in the anatomical position. International morphological terminology is used by the descriptive and functional. Basically, it covers the gross anatomy and the microscopic (histology and cytology) of living beings. It involves both development anatomy (embryology) and the anatomy of the adult. It also includes comparative anatomy between different species. The vocabulary is extensive, varied and complex, and requires a systematic presentation. Within the international field, a group of experts reviews, analyzes and discusses the morphological terms of the structures of the human body, forming today's Terminology Committee (FICAT) from the International Federation of Associations of Anatomists (IFAA). It deals with the anatomical, histological and embryologic terminology. In the Latin American field, there are meetings called Iberian Latin American Symposium Terminology (SILAT), where a group of experts of the Pan American Association of Anatomy (PAA) that speak Spanish and Portuguese, disseminates and studies the international morphological terminology. The current international standard for human anatomical terminology is based on the Terminologia Anatomica (TA). It was developed by the Federative Committee on Anatomical Terminology (FCAT) and the International Federation of Associations of Anatomists (IFAA) and was released in 1998. It supersedes the previous standard, Nomina Anatomica. Terminologia Anatomica contains terminology for about 7500 human gross (macroscopic) anatomical structures. For microanatomy, known as histology, a similar standard exists in Terminologica histologica, and for embryology, the study of development, a standard exists in Terminologia Embryologica. These standards specify generally accepted names that can be used to refer to histological and embryological structures in journal articles, textbooks, and other areas. 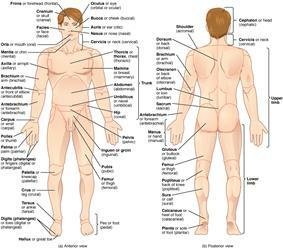 In terms of anatomy, the body is divided into regions. In the front, the trunk is referred to as the "thorax" and "abdomen". The back as a general area is the dorsum or dorsal area, and the lower back as the lumbus or lumbar region. The shoulder blades are the scapular area and the breastbone is the sternal region. The abdominal area is the region between the chest and the pelvis. The breast is also called the mammary region, the armpit as the axilla and axillary, and the navel as the umbilicus and umbilical. The pelvis is the lower torso, between the abdomen and the thighs. The groin, where the thigh joins the trunk, are the inguen and inguinal area. The entire arm is referred to as the brachium and brachial, the front of the elbow as the antecubitis and antecubital, the back of the elbow as the olecranon or olecranal, the forearm as the antebrachium and antebrachial, the wrist as the carpus and carpal area, the hand as the manus and manual, the palm as the palma and palmar, the thumb as the pollex, and the fingers as the digits, phalanges, and phalangeal. The buttocks are the gluteus or gluteal region and the pubic area is the pubis. The more detailed regional approach subdivides the cavity with one horizontal line immediately inferior to the ribs and one immediately superior to the pelvis, and two vertical lines drawn as if dropped from the midpoint of each clavicle, resulting in nine regions. The upper right square is the right hypochondriac region and contains the base of the right ribs. The upper left square is the left hypochondriac region and contains the base of the left ribs. The epigastric region is the upper central square and contains the bottom edge of the liver as well as the upper areas of the stomach. The diaphragm curves like an upside down U over these three regions. The central right region is called the right lumbar region and contains the ascending colon and the right edge of the small intestines. The central square contains the transverse colon and the upper regions of the small intestines. The left lumbar region contains the left edge of the transverse colon and the left edge of the small intestine. The lower right square is the right iliac region and contains the right pelvic bones and the ascending colon. The lower left square is the left iliac region and contains the left pelvic bone and the lower left regions of the small intestine. The lower central square contains the bottom of the pubic bones, upper regions of the bladder and the lower region of the small intestine. 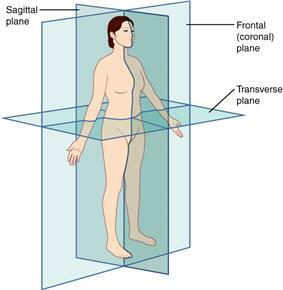 The three anatomical planes of the body: the sagittal, transverse (or horizontal), frontal planes. Patent, meaning a structure such as an artery or vein that abnormally remains open, such as a patent ductus arteriosus, referring to the ductus arteriosus which normally becomes ligamentum arteriosum within three weeks of birth. Something that is patent may also refer to a channel such as a blood vessel, section of bowel, collecting system or duct that is not occluded and remains open to free flow. Such obstructions may include a calculus (i.e. a kidney stone or gallstone), plaque (like that encountered in vital arteries such as coronary arteries and cerebral arteries), or another unspecified obstruction (such as a mass or [bowel obstruction]). 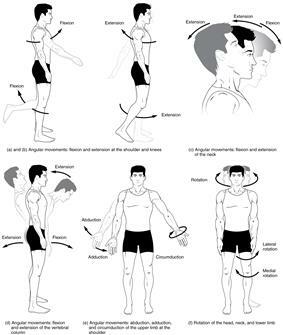 Internal rotation (or medial rotation) and External rotation (or lateral rotation) refers to rotation towards (internal) or away from (external) the center of the body. For example, the asana posture in yoga requires the legs to be externally rotated. 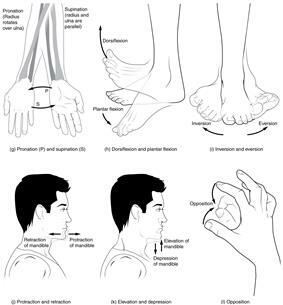 Pronation and Supination refer to rotation of the forearm or foot so that in the anatomical position the palm or sole is facing anteriorly (supination) or posteriorly (pronation) rotation of the forearm. For example, a person skiing must pronate their arms in order to grasp the skis. 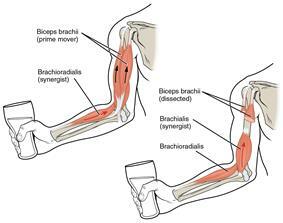 The biceps brachii flex the lower arm. The brachoradialis, in the forearm, and brachialis, located deep to the biceps in the upper arm, are both synergists that aid in this motion. This WorldHeritage entry incorporates text from the freely licensed Connexions  edition of Anatomy & Physiology  text-book by OpenStax College. Visceral and parietal' describe structures that relate to an parietal peritoneum surrounds the abdominal cavity.